The PSNI seized the cannabis from a car after a search. The PSNI have announced they are to introduce cannabis 'scratch and sniff' cards to promote drug awareness. Cards will be circulated among parents, guardians and community groups so that they will be aware of the smell of the drug. 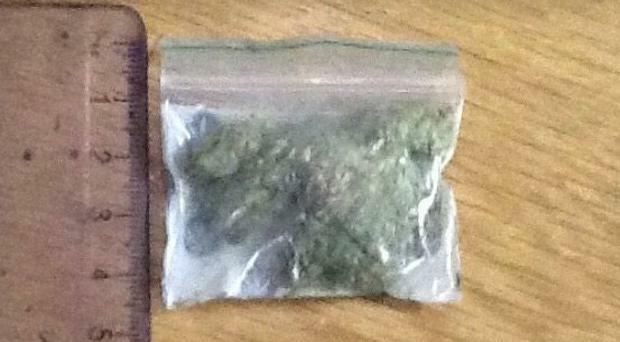 The plan was revealed by a PSNI spokesperson on the PSNI Omagh Facebook page after police seized a bag of cannabis (pictured) from a car. They plan to hold a number of drug awareness meetings in the coming months. "Even this small amount of herbal cannabis had a pungent enough smell to stink out a car and prompt us to conduct a search," the spokesperson said. "If you don't know what cannabis smells like (many people genuinely don't) then let us know at Omagh Neighbourhood as we are awaiting a consignment of cannabis 'scratch and sniff' cards and will be offering to hold drug awareness meetings for parents, guardians and community groups over the next few months."